When it comes to dividing household labor, what matters is not how you divide up the labor but whether you have someone with whom to divide the labor. We discussed with STI Experts Laurie DeRose and W. Bradford Wilcox some of the conclusions of the World Family Map 2015. You have just released the latest edition of the World Family Map; why is this year’s report focusing on how couples divide paid and domestic work? Much was already known about how couples in the United States and Europe divvy up work, but we wanted to add countries from other regions—from Asia to Africa—around the globe to see how they divide the labor associated with childcare, housework, and paid work outside the home. Were there interesting differences between regions? As the figure above indicates, northern Europe stood out as having the greatest share of couples departing from traditional gender roles where the man does more paid work and the woman does more domestic work, but perhaps the most interesting finding was how similarly couples divide labor in the rest of the world. In most of the world, we found that no one pattern describes how couples with children divide up paid and domestic work. Large minorities rely on a traditional division of labor, large minorities are pretty egalitarian, and a number of other combinations can be found in many regions throughout the world—from Australia where many women with paid jobs work fewer hours than their partners to Southern Europe, where most women who do work at least as many hours as their partners still do much more domestic work. Can you explain why places with different cultures and different economies have couples who divide labor in similar ways? A big part of the explanation for that is that having children is strongly associated with a more traditional division of labor in richer countries. Couples without children are more egalitarian in wealthier countries than in less wealthy countries, but the division of labor seems to change more when a child comes along in wealthier countries. This means that the division of labor among parents is pretty similar across world regions. Why does it matter how couples divide labor? Our project wants to measure determinants of family strength. There is a common belief now that an unequal division of labor leads to bitterness and unhappiness; by contrast, others think that if partners do all the same things, they are more likely to end up bored with one other than if they filled complementary roles. We tested the relationship between the division of happiness and whether that relationship differed between world regions. Were egalitarian couples happier overall? We were surprised to find that how a couple divided up paid and domestic work was not related to happiness. With a few exceptions, in most regions of the world it didn't matter whether the division of labor was traditional, egalitarian, or which gender carried a heavier load—people tended to be about equally happy. Only in Eastern Europe did people seem the happiest when labor was divided along traditional gender lines. What did matter for happiness? 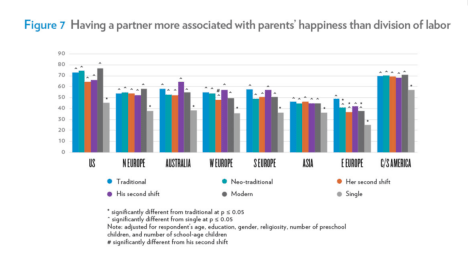 Single parents were less happy than partnered parents in every world region, no matter how the partnered parents divided paid and domestic work. Even women who did as much or more paid work plus more domestic work than their partners were still happier than single parents. So it seems like having a partner may contribute to parental happiness even when that partner doesn’t carry a fair share of the load. In other words, this new study suggests that what matters for parents’ happiness is not so much how they divide up the work associated with managing a household and putting bread on the table, but whether they can share that vital work with a partner.